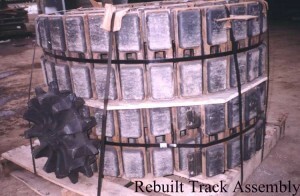 Sets of tracks wear out on track pavers and they are very expensive to replace. Paver operators are very cost conscious and want to do all they can to reduce there costs of operation and get maximum value from the replacement wear parts that they purchase. There is confusion in the minds of some purchasers about rebuilt tracks. They think that taking the old cross shoes and disassembling the old bands and pads and then reassembling the old cross shoes with new bands and/or pads gives them a rebuilt set of tracks. We call this an assembled set of tracks, not a rebuilt set of tracks. ACE Group has lost sales to competitors where they have matched our rebuilt track prices, however, they have only supplied the customer with a set of assembled tracks. This is a major loss for the customer as the rebuilding of the cross shoes, the regrinding, the reforming and recentering of the sprocket engagement holes in the cross shoes is the most important part of the rebuild track system. If you do not get your cross shoes and sprockets rebuilt then the pitch of the holes in your cross shoes can be way off the 4 and a 1/4 hole centerlines that they are supposed to be. This is generally made worse by the fact that the competitor who is doing the reassembly will remove the cross shoes and put them all in a heap. Then when they come to reassemble the track with the new bands and pads they take the first cross shoe they put their hands on. This means that the cross shoes are reassembled in a different sequence than the original wear pattern that the cross shoe developed with the sprocket. They are often even put on the opposite side of the paver than the one they came off of. This means that the wear patterns on the cross shoes and the wear patterns on the sprocket are completely different. This accelerates wear dramatically from the moment the reassembled tracks are put back on the paver. The original cast cross shoe and the original sprocket is only case hardened to 1/8inch to Rockwell hardness of 56. Once you wear through this tough layer the rest of the cross shoe and the sprocket is a softer metal that wears out very quickly. When you reassemble the track with new bands and pads and do not realign the shoes to the same wear pattern as the original track then the sprocket (which will also be well worn before the reassembly) has a soft worn surface which is now wearing on a cross shoe with a soft worn surface. Both have no case hardening left and each will be forced to wear a new pattern on each other due to the cross shoes not being replaced in the same order as they were originally. The average pitch for the newly assembled track will not be the 4 1/4inch between each cross shoe from center to center that they are supposed to be. One could be 4 3/8 and the next one 4 ¾inch. This varying pitch length from standard needs to be taken up by theband having to stretch to make up the difference. The steel cables within the band do not like to stretch and this leads to significant shortening of the life of the bands which leads to premature track failure occurring approximately 33% sooner than when the tracks are rebuilt properly. For the above reasons we do not recommend that you ever just reassemble your tracks with new track bands and pads without rebuilding your cross shoes and your sprocket teeth at the same time as this is absolutely false economy. If you request us to do it because you are selling your paver and do not care about the life of the track and you just want the paver to look good, we will give you the most competitive assembly price in the market, however, we provide no warranty on the life for the above reasons. With ACE Group rebuilt tracks every cross shoe is rebuilt with chromium alloy rod which builds a layer with a Rockwell hardness of 56 or better. On the new cross shoes the case hardened layer is only 1/8inch deep. When ACE Group rebuilds the cross shoes, the worn areas are re-established. The rebuilding, regrinding, reforming and recentering of sprocket holes in the cross shoes means that these heavy wear areas finish up with a reprofiled, hardened wear surface of ¼inch to 3/8inch, which is two to three times more hardened thickness than a brand new cross shoe. The rebuilt cross shoe is rebuilt to a better specification than the brand new cross shoe and this reflects in increased life and an absolute minimum of stretching of your track bands. All of the pitch centerline measurements for the sprocket holes on your track are once again the specified 4¼inch which promotes maximum possible wear life. We also rebuild your sprockets, which because of the same dynamic as the cross shoes with the rebuild process gives your sprockets between ¼inch to 3/8inch of re-established wear depth, which is two to three times more hardened thickness than a brand new set of sprockets. Rebuilding costs approximately half of the replacement cost of new sprockets as long as the splines are in good condition. New pads and bands are included with our rebuilt tracks. Our bands are 7 strand Nicron 58 cable LH and RH wound to stop uneven winding pressures on the bands. With Nicron 58 cables, you will be operating with the best available specification for today’s long life track rebuilds. We use only TOP QUALITY POLYURETHANE TRACK PADS for maximum wear. 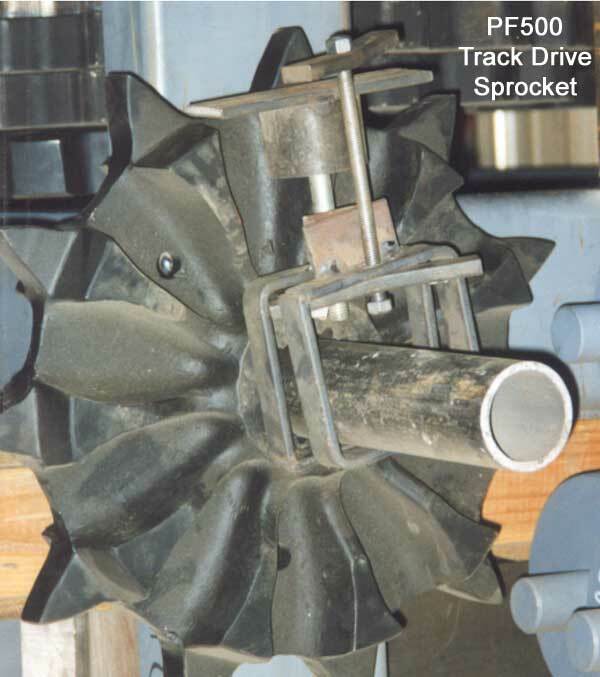 Use ACE Group rebuilt tracks and sprockets with ACE Group bands that have 7 cables in them and are left and right hand wound to stop uneven winding pressures on the bands. With a Nicron 58 cables you are operating with the best available specification for today’s long life track rebuilds. If you cannot get quality manufacturing process or component quality guarantees in writing from your supplier before you purchase which confirms that your supplier is delivering you comparable quality and value, then you could be increasing your operating costs dramatically. 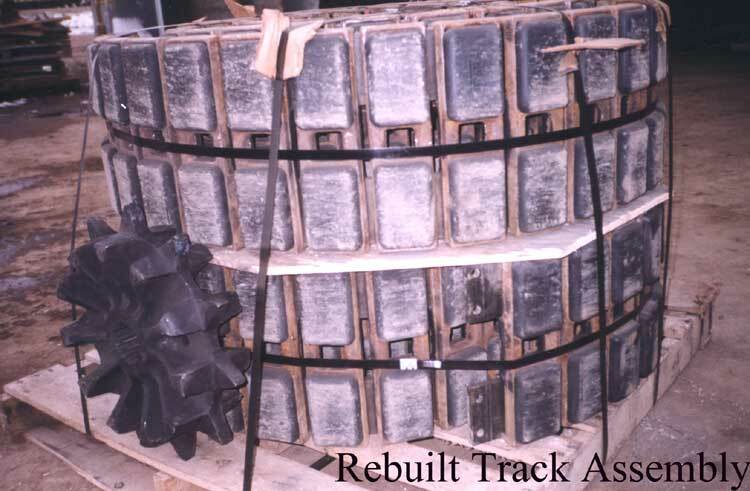 When you compare the quality of inferior rebuilt tracks, as well as inferior bands and pads with the ACE Group rebuilt tracks, sprockets, bands and pads you will avoid the dissatisfaction that comes from buying based only on price. If you cannot get definite written assurances that your alternative supplier has equal or better standards, then you are comparing lemons with oranges. ACE Group incorporates superior quality manufacturing standards into its rebuilt track cross shoes, sprockets, track bands and pads. ACE Group prides itself on delivering you the industries equal to best or clearly best quality, at very competitive prices. When you compare all of the facts, ACE Group delivers rebuilt tracks that will provide the least cost per hour of your paver’s operation for the life of those tracks when compared to any competitor in the market by a considerable margin of savings. You receive ACE Group rebuilt tracks, sprockets, bands and pads of equal or better quality than an OEM product for 30% to 50% less cost than the OEM equivalent products. This superior quality delivers improved performance for your pavers and significant cost savings for you and your paver operation. ACE Group has described the competitive benefits of the ACE Group track bands and track pads in separate summary sheets, so ensure that you request these from your account manager before making your purchase decisions. We want you to be a fully informed customer who clearly understands the quality and value relationship so the low quality commodity manufacturers don’t get your money and you get the problems and hassles that go along with them. Maximum possible wear life is achieved because of the higher specifications which our rebuilt components meet, but also because of the re-centering of sprocket holes. All of the pitch centerline measurements for the sprocket holes are once again the specified 4.25inch which promites maximum possible wear life. Your rebuilt tracks, sprockets, bands and pads are of equal or better quality than an OEM product. This superior quality delivers improved performance for your pavers and results in signficiant cost savings to you.